Once again, this month's Archive of the Month from the Representative Church Body Library brings a reminder of the value of the Ecclesiastical Church Gazette (remed Church of Ireland Gazette in 1900) as a source of stories that reveal the community issues affecting our ancestors – whatever their religion. The former St Peter’s Church, Castletownbere. This April's Archive examines the hidden story behind the dismissal of the Revd George F Stoney, the curate in the West Cork parish of Berehaven in 1868. He ministered at the chapel-of-ease at Allihies, where the population was largely comprised of the mining families from the nearby copper mines. 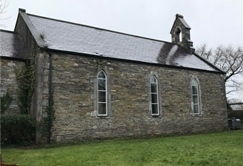 The former parish church, dedicated to St Peter, was sited in the town of Berehaven (now Castletownbere); Berehaven Miners church (also known as Kilnamanagh church) was located 12 miles further west. The backdrop to his sudden dismissal was a socio-economic one linked with the copper-mines at Allihies, owned by Berehaven’s leading landowner: Henry Lavallan Puxley of Dunboy Castle. In operation since 1812, Allihies mines had attracted an influx of Cornish miners. Changes introduced by a new manager appointed in the aftermath of a miners’ strike in 1864, combined with a sharp fall in the price of copper, led to a drastic reduction of the workforce. Although there was an attempt to replace some Irish workers with Englishmen, most of the miners were natives of Beara and Roman Catholics. Allegations were frequently made that the better positions were awarded to English workers and that the Irish miners were exploited and forced to live in squalid conditions. These charges were validated by Mr Stoney in a letter published in the Cork Examiner on 4 March 1868 which detailed the ‘real agonising poverty of the people’. A subsequent letter of Stoney’s was published in The Nation on 16th May 1868, and even more direct in its criticism of the mine-owner and more stark in its description of the lives of the miners. Needless to say, the Revd John Halahan, rector of Berehaven, was not impressed to learn that his curate was speaking out, and examination of the full presentation will reveal that the Revd George Stoney came off second in the ensuing conflict.